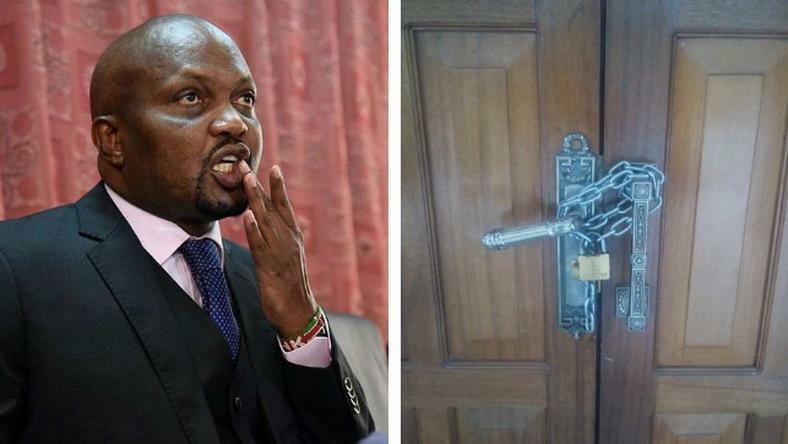 Thursday April 4, 2019-Gatundu South MP, Moses Kuria, is currently broke and he is unable to pay his bills including an 8 month rent arrears from a house he has rented. Kuria is the Chairman of Emerging Capital Holdings (ECH) which runs several businesses, including Fanaka TV, and which are based at Bonfide House along Riverside lane in Nairobi. According to one employee, who requested a condition of anonymity, Kuria’s businesses have been struggling in the past months with employees going for several months without pay. “Some of us have not received a salary in 2019 while others received the last paycheck in January and February. Nobody seems bothered about how employees pay their rent and other bills,” she said. On Wednesday, Bonfide House agents closed Kuria’s businesses for non-payment of rent for 8 months. The agents also confiscated several television sets, computers, and other valuables from FanakaTV offices. Kuria’s troubles started when he started bashing President Uhuru Kenyatta a couple of months ago. In January, Kuria caused a storm after he accused Uhuru of taking Mt Kenya voters “for a ride” by overlooking them in distribution of national government projects.